Die cut magnet. Heavy gauge magnetic vinyl. 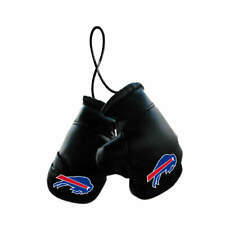 NFL Team Boxing Mini Gloves. Made of black vinyl with printed team logos. The two gloves are attached with a nylon string so they can hang from a car rear view mirror. Or anywhere you like. Show your team pride. Buffalo Bills. Size: fits up to 16" tire. This is a tire cover for the. Elastic tie down for easy fit.easy to clean. Two-sided car flag. 100% Polyester. Show your team pride everywhere you go with these seat belt shoulder pad covers from Fremont Die. With a soft velvet material, your neck will love you! Velcro closure. Set - 2 Seat belt shoulder pads. Two-sided car flag. It features vibrant team graphics over a team-colored backdrop. Steer your vehicle in the right direction with this steering wheel cover from Fremont Die! Fits standard size car, truck and boat steering wheels. Material: 100% Polyester. It's made of heavy gauge magnetic vinyl, so it lasts and lasts. Colors stay bright, indoors or out! Plus, it's flexible, so it looks great on curved surfaces. The magnet is 12" in size. 100% Durable Heavy Gauge Vinyl Magnet. BUFFALO BILLS. OFFICIAL TEAM LOGO AT TOP. EXTRA TIGHT TO AVOID SLIPPAGE. FITS MOST SIZE STEERING WHEELS. This high quality NFL flag is constructed of polyester and is 3'x5' in size. The design is viewable from both sides, with the back side being a reverse image. Its also perfect to use as a wall hanging for your rec room, office, den or any other room. 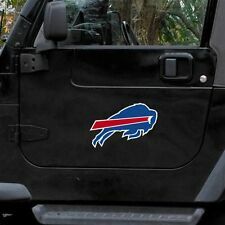 Buffalo Bills Ombre Printed Car Auto Window Flag This Buffalo Bills Car Window Flag is a perfect way to show your NFL allegiance around town and fits on any vehicle window! The NFL Car Flag includes the Plastic Pole and Mounting Bracket. MADE BY FREMONT DIE. 70% POLYESTER 30% RAYON. DURABLE CONSTRUCTION FOR LONG LIFE. EMBROIDERED TEAM LOGO. ONE SIZE FITS MOST SEATS. BUFFALO BILLS. One sided but image appears on both sides. DESIGN STYLE OMBRE. BUFFALO BILLS. THIS TWO-SIDED CAR WINDOW FLAG EASILY ATTACHES TO ANY CAR WINDOW. 80 DENIER 100% POLYESTER IS UV FADE RESISTANT. DOUBLE-STITCHED WITH PERMACORETEX-60 THREAD. MACHINE WASHABLE. BUFFALO BILLS CURRENT LOGO. MADE OF HEAVY GAUGE MAGNETIC VINYL. Universal Fit with hook and eye closure. 2 Seatbelt Pads Included. BUFFALO BILLS. DRIVE IN STYLE WITH THIS HIGH QUALITY STEERING WHEEL COVER! THE STEERING WHEEL COVER EASILY STRETCHES TO FIT CAR, TRUCK, AND SUV STEERING WHEELS. MADE BY FREMONT DIE. STEERING WHEEL COVER. IT FEATURES A VELCRO CLOSURE FOR UNIVERSAL FIT ON ALL SEAT BELTS. BUFFALO BILLS. THIS IS A PAIR OF. Fly Your Team Allegiance Show the Neighbors which team your Rooting for with our. BY: Fremont Die. TEAM: Buffalo Bills. I am always willing to work issues out. I will not knowingly list inaccurate information. Universal Fit. Designed with Snug Fit. Can also be hung vertical as a banner. Huge 3' x 5' NFL Flag. Officially Licensed NFL Flag. Headband with 2 Brass Grommets to Attach to Flagpole. High Quality. Use Indoors or Out. Publisher: Fremont Die Inc. Product Specifications. NFL FOOTBALL TEAM LOGO SUEDE MESH CAR AUTO STEERING WHEEL COVER-PICK YOUR TEAM! NFL NATIONAL FOOTBALL LEAGUE PLUSH FUZZY DICE CAR AUTO MIRROR - HANG ANYWHERE! Outdoor/indoor use. We will happily accomodate you as best and quickly as we can. 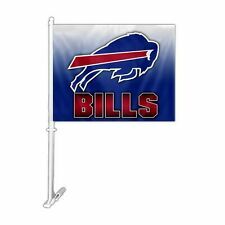 NFL Buffalo Bills 3' x 5' Large Flag. Fly Your Team Allegiance Show the Neighbors which team your Rooting for with our. RETRO STYLE FUZZY DICE WILL HANG NICELY FROM YOUR REAR VIEW MIRROR OR ANY OTHER PLACE YOU CHOOSE. THEY ARE 3" SQUARE WITH THE TEAM LOGO LOCATED IN THE ONE DICE SPOT. IT WILL STRETCH TO FIT CAR AND MOST TRUCKS AND WILL SLIP ON IN SECONDS WITH NO LACING REQUIRED. This Bar Stool Cover is made of heavy gauge vinyl for durability and easy cleaning. The top is shiny vinyl with the logo. The side panel is matte vinyl. Spruce up your old stools or redecorate your new stools with this cover that is made for swivel and standard seat bar stools. NFL Poly-Suede Steering Wheel Cover. Need your item quicker?. Fits Most 14" to 15" Steering Wheels. We would love to be given the opportunity to work with you to resolve any problem you may have. Team Logo at the Top of the Cover. Need your item quicker?. We would love to be given the opportunity to work with you to resolve any problem you may have. Make sure this fits. by entering your model number.